SIGforum.com Main Page SIG Pistols So...what happened to the Hudson H9? Seems like it took a left turn then promptly fell off the face of the planet. I heard and read grumblings about reliability. Saw a few YT vids throughout last year. And now 2018 is about 1/3rd done and no one says much of anything about the gun. An expensive piece of reinventing-the-wheel. That's what happened. Fizzled... Other pistols on the market that could perform on par or better I guess..
Like many others, it was popular because of the internet buzz that was created about it. And once the buzz died, so did the pistol. Ford Edsel strikes again. Advertising can create awareness, but it can't make anybody buy something they don't want or don't understand the reason why they should want it. There are apparently some out there being shot. The question is, will a one trick pony be able to hang in there. Established manufacturers are scrambling for every little niche in a crowded market. I must have been under a rock. I hadn't heard of it, then discovered one for sale on a local board here. Nigh on impossible for anything to displace my love for a 226, though. I must have been under a rock. I hadn't heard of it, then discovered one for sale on a local board here. I hadn't seen that. I meant there is one on a board in Las Vegas right now. I guess it looks okay but I'm not for abandoning what works for the next "great" thing. I saw one at the last gun show I went to. It felt and looked OK, but it's a $1100 9mm. That's a market point that's pretty crowded with a lot of very nice, established pistols. Kinda hard to break in there. my local shop has one for sale used. The previous owner bought it and a DW valor 9mm. He ended up keeping the valor. I was able to shoot the hudson, hell we put 650 rounds through it with the owner. It shot everything, not one failure. I was really pleased with how it shot, felt, and the quick pick up from the recoil. It is a great gun. When (if) a 2.0 comes out at a better price point and some issues fixed I'll probably get one just for something cool at the range. It's also approved for USPSA Production and may be where this thing shines. At the range (ReLoad) Tarpon Springs Florida has one in their show case. My local range has one to rent. I shot it and it’s a nice gun. I’m not going to buy one of course but I’m glad I got the chance to shoot it. It’s an $1100 steel frame pistol. That’s a limited market. The example I got to shoot shoots well. They released an alloy frame version at SHOT this year which is supposed to have a slightly lower price point. I'd rather have this one back, a Colt revolver with a camera attached from 1938 NY. ^^^^ Just hang your body cam on your Python, and you have the same thing. 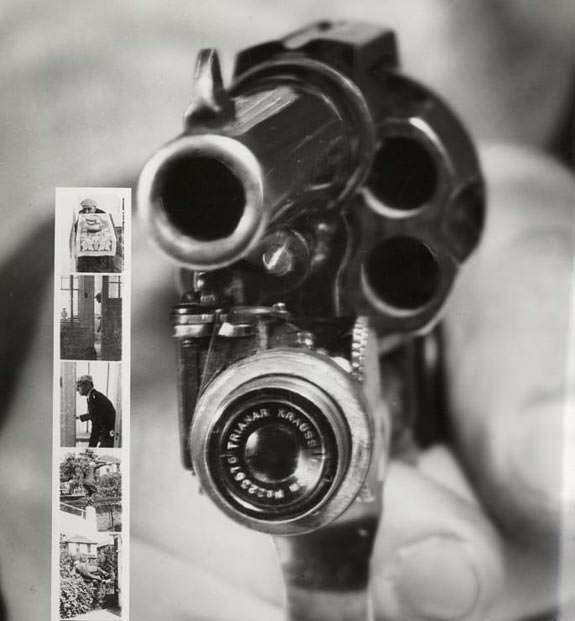 a Colt revolver with a camera attached from 1938 NY. Quick Reply to: So...what happened to the Hudson H9?